Police officers put everything on the line each day to protect their community. 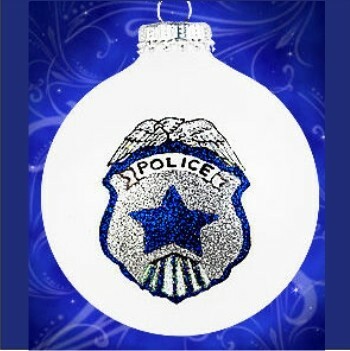 This shield of pride police glass personalized Christmas ornament is a wonderful way to let them know that their efforts are appreciated. Policemen and women in your family or among your friends will truly enjoy being recognized this season. And why not drop in at the station and surprise the LEO's in your town with a token of your regard for the job they do? Give us the details you want added to this handcrafted ornament, including your message of gratitude and encouragement, and our lettering experts will add them with style. This is one of the police ornaments personalized for a hardworking officer of the law that Russell Rhodes is proud to make available. Bought for Several LEOs in family Nov 8, 2014 Debbie L.